The project was run by Unpuzzled Theater, which was set up by Jamie Oliver Jones and Tori Brown, who trained together in community theater in the U.K. 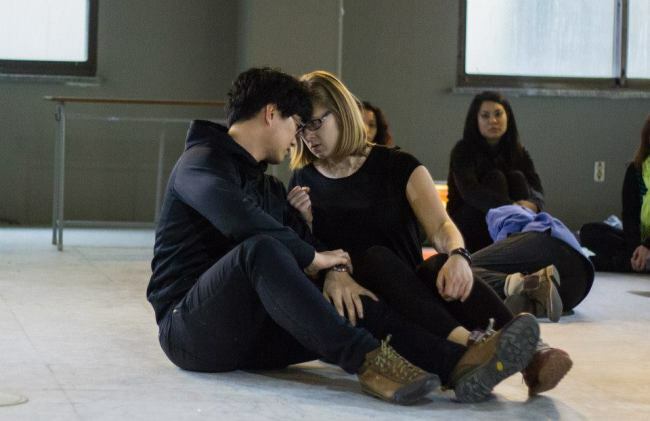 The project had set out to include Koreans and expats as an inclusive community project to bring together a cast to collaboratively develop the show from scratch. The show is split up into several short performances. Many are nonverbal, while others use a mix of Korean and English, including a poetry section and a bilingual song created by the project members. In one piece, “Endure,” many more languages are used, as the cast explores universal ideas about war, loss and grief. “It doesn’t matter which side you fight on. We are all the same people and we all experience loss,” Brown said. Most of the 11 segments are directed by Jones and Brown, but Gwangju Performance Project members Joey Nunez and Boipelo Seswane are directing their own. Seswane said hers was based on the pressure in Korea to present a certain image all the time. “That can get tiring, and you can lose a bit of yourself. Your way of loving is defined by how other people treat you and you treat yourself,” she said. These opinions, she added, can feed into each other and reinforce themselves. “It depicts the taking and giving of love and how that shapes your perceptions of yourself,” she said. Kim Eun-kyoo, who has been involved in the project since the beginning, said the project was a great idea. “It was great because we don’t get many chances to meet people from other countries in our daily lives, but I have met many friends from all over the world in the same project,” he said. It also attracted many expats who were new to theater. Brown said some of the cast had not been involved in drama before, partly because of the need to attend auditions, something she dislikes. “I think they are unfair and I don’t think you see the full potential of a person or an actor,” she said. Another first-time actor was Charles Ocampo, who thought it would be fun to challenge himself before he went home to LA. But Jones pointed out that the open-door policy meant that there is some uncertainty regarding the cast, although only seven of the 30 people who attended the sessions have dropped out. He said that many of the challenges were similar to community theater projects they had done in the U.K., including finding a balance on how hard to push the cast. “You don’t want to crack the whip too hard, but you do want it to be as good as possible,” he said. Brown said it was important to simplify language, even in the U.K.
“If I were to say, ‘Today we are going to use the techniques of Rudolf Laban,’ they would (not understand) or just not care,” she pointed out, adding that additional simplification was needed for a cast who didn’t all speak English fluently. But this doesn’t mean they avoid the techniques themselves. For example, they used Leban’s ideas about movement for “Love Me,” which Seswane found very helpful. “Because we try not to use language or make the pieces very language-based, it’s great because you are able to emote and therefore communicate with your movement and body,” said Seswane. Other people appreciated the application of professional techniques, including Joey Nunez, who worked with Brown on the Gwangju Performance Project’s production of “Proof” last year. Brown and Jones are set to return to England next month, where they will pursue more community theater projects. They will be raffling off several items, including two guitars and a laptop computer to help pay for the project. Raffle tickets will be available on the night. Refreshments will also be on sale. The performance will run at Barim Theater in downtown Gwangju on Saturday at 7:30 p.m. Admission is 10,000 won. For more information, search for the event page “The Truth about Love” on Facebook.